This entry was posted in Heard Online and tagged Furflight, furries, Midwest Furfest by Mike Glyer. Bookmark the permalink. Dear Halford, again? No real planning, no business plan, no one talks to a lawyer to make sure things are kosher, over-promises to fans, and in the end a lot of people get screwed. They didn’t even offer an extra hour in the ball pit. But aside from the utter failure on every level possible, there was one thing that struck me. Who in their right minds would stuff themselves into an airline seat in a freaking fursuit? The sheer torture aspect is one thing, the potential damage from being forced into those narrow seats is another. Just a terrible thing from start to finish. Thanks for covering this. Mike Folf is a nice guy who got way over his head. After my article posted, I was at a party at his house a few days after this came out (he wasn’t there) and heard talk from close friends, and spoke to a finance professor/furry at a convention who corroborated some info he’d learned from Mike as far back as June. This venture was generally well liked with many happy stories about filling planes with furries, until the financial upset. This is a cautionary tale that doing business is different from doing fandom things because people like them. I just sent in a tip. Mike found tons more. Wow. I really wish that people would consult proper lawyers and other people who know what they’re doing before starting a business. Mike Folf is probably going to be in a world of hurt from what looks like–all financial considerations aside–possibly breaking the law in California wrt travel agencies. Jumping in with both feet and eyes closed is not a good business plan. But aside from the utter failure on every level possible, there was one thing that struck me. 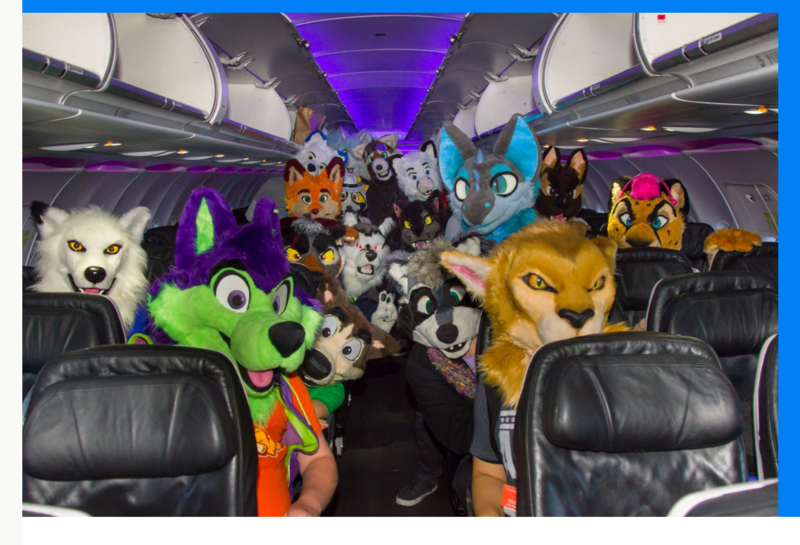 Who in their right minds would stuff themselves into an airline seat in a freaking fursuit? Mike Folf is probably going to be in a world of hurt from what looks like–all financial considerations aside–possibly breaking the law in California wrt travel agencies. Basically, a folf in sheep’s clothing. Darren, go sit in the corner and think about what you just said.